Me despite what “some” may think I’m pretty liberal, yes I’m extremely conservative as well. I believe in original intent of our Constitution and believe as they have about limited goverment. I believe marriage is between a man and woman, at the same time I don’t want goverment involvement. IMO goverment must at all times remain neutral. I believe in preservation of cultures, tradition and heritage…but I don’t want goverment promoting any of it…same goes for religion. I don’t want goverment promoting one religion over another nor do I want goverment to interfere with our religion. Again government must remain neutral. But for “some” reasons authoritarians whom I call libs and repugs calls me alt-right…or other extremist names. But yet I do admit I see them as extreme…wanting goverment to impose their beliefs onto society while hiding behind the banter of liberalism. They aren’t liberal. They’re authoritarians and if left to their own devise we would quickly become a dictatorship goverment by goverment runned thugs. Except in her case, she is drunk, standing on a bar, and removing her clothes. how is this inciting violence? and how is it fascist? Its just a complete distraction to draw attention away from Omar minimalizing mass murder. “How dare Trump notice what she said”. If it had been the reverse and a Republican had tried this trick the media would have been all over them. Democrat Politicians acting up Good! and do anything even if it is illegal or immoral, and get away with it. lol. Yep. 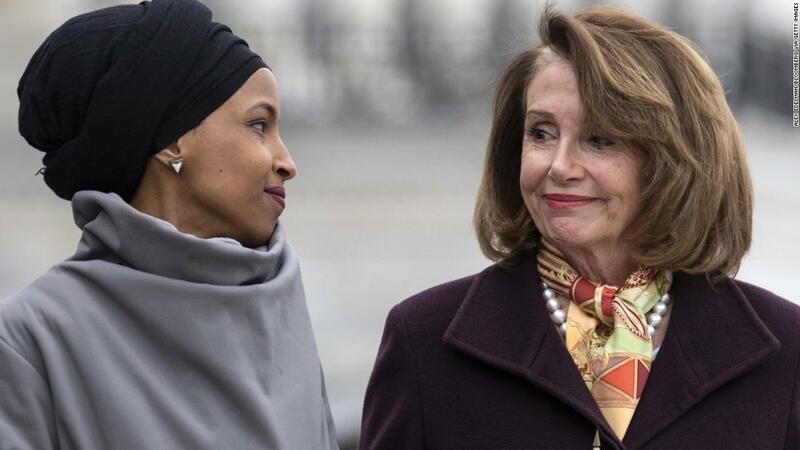 The three stooges Omar, Tlaib and AOC are being exposed for what they are. Over paid windbags. Some people might do some thing? Pelosi having a well staged tizzy fit is not the same thing as Trump getting out of hand. Thanks Conan. I was actually referring to something even primary to one’s beliefs… we can all have different beliefs, of course but is it really true that our own identity must be in them/defined by them ? Oh please 9/11 “it’s in the past”. Slavery is also in the past (Way) further back yet the left is calling for reparations for something that ended over 150 years ago. Can’t we apply the same logic “It’s in the past”? I am assuming every member on this forum was alive during 9/11, I doubt we will find to many posters from 1865 still posting. Errr, SHE is the one who brought up 9/11. He is responding to HER. What you’re saying is that whenever a Muslim says something hugely offensive to millions of Americans no one can call them out on it. They get a pass because they are Muslims. I would change one word in that post. Enabled to enabling. how is trump to blame? Well, if CRCs follow the trend, they will now attack AOC. She SHOULD have very clearly specified that those “some people” were people from Saudi Arabia…the country donnie is giving nuclear technology too. She wasn’t specific enough, I agree.